Starbucks are awesome. Did you know that? 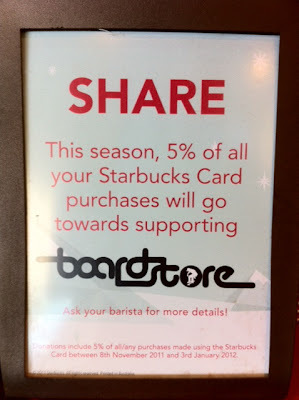 They are giving Boardstore 5% of all purchases made using a Starbucks card in their Mooloolaba branch from now until the new year! So legit. Now I already know you go to Starbucks Mooloolaba. It's like YWAM SC's second blue room. I can't walk past the place without seeing someone having a "one on one" there. And I know you SC skaters are way classier than you want people to know and sneak around with Flat Whites pretending they're Redbulls. So I am asking you please please please don't pay with cash or eftpos! You can get any amount put on a Starbucks card and pay with that instead and then we get cash! COLD HARD CASH! And if you are frequenting a different coffee establishment, please consider switching to Starbucks for a spell. You're planning on meeting up with someone to catch up on their life and all their comings and goings? Why not choose Starbucks Mooloolaba for their friendly laid back atmosphere and their awesome choice of business partnerships? Going away drinks? Starbucks Mooloolaba. Birthday party? Starbucks Mooloolaba. Wedding reception? Starbucks Mooloolaba. Secretive courtship non-date? Say it with me... Starbucks Mooloolaba. "Hi, I'd like a Supremo Chai Latte on Soy with a shot of Espresso and extra syrup with a rasher of bacon in it"
"That's not at all disgusting and will be $6.95"
"Sure, can I please put this cash in my hand onto a Starbucks card and pay with that?" "Absolutely, you must be friends with Boardstore, how very on the ball of you!" "Yes we love Boardstore, they're the best most yo dizzle skateshop in the whole of Australia and straight after I drink my franken-chai I'm going to go there and buy all my Christmas gifts!" Thanks guys, we love you!